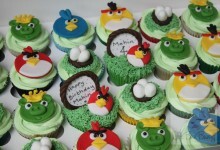 24 Vanilla EGG FREE cupcakes decorated with an Angry Birds theme. Happy Birthday Mahin! 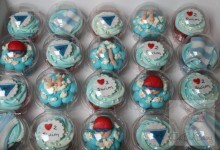 24 Swimming themed cupcakes, a mix of Vanilla and Funfetti flavours Happy 40th Ben! 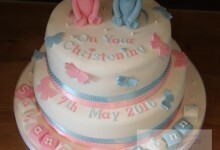 A 9 inch round DAIRY FREE chocolate cake, covered in sugarpaste, topped with bespoke model T-Rex and decorated in a Dinosaur theme. 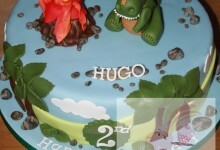 Happy Birthday Hugo! 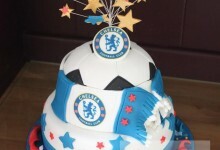 A 7 inch round cake with a domed football shaped cake on top, covered in sugarpaste and decorated in a Chelsea Football Club theme. 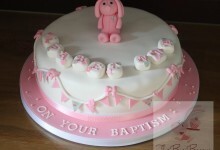 Happy Birthday Lewis! 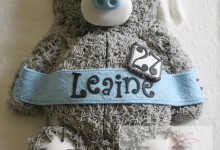 A 10 inch square cake, covered in sugarpaste, topped with bespoke model topper and Marathon themed decorations. 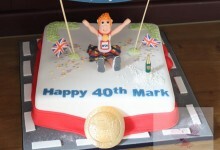 Happy 40th Mark!